A significant challenge for the successful commercialization of organic devices, is their limited lifetime. Extrinsic as well as intrinsic factors cause deterioration of device performances during operation and these therefore needs to be thoroughly investigated to minimize their influence. The extrinsic degradation is generally the result of oxygen and moisture diffusion from ambient into the device causing a reaction with the active layers or the cathode in both light-emitting diodes and solar cells. The intrinsic degradation is arising from intrinsic processes, in which the device materials change structure with time during normal device operation. This can e.g. be morphological or chemical changes in the active layers that lead to trapped charges, which can alter both the charge carrier profiles and recombination rates. The problems induced by both extrinsic and intrinsic factors are NOT straightforwardly solved and thus represent a principle obstacle for use and commercialization of hybrid and organic devices. 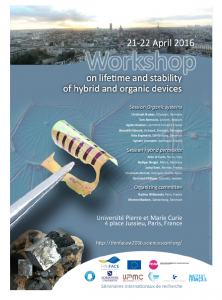 In the framework of the THINFACE project, we propose a workshop on lifetime and stability of hybrid and organic energy devices that includes all involved experts and younger researchers from the THINFACE network together with external experts from the community in France and abroad. Researchers, private companies, PhD candidates and master students are welcome to register to the event. The workshop is sponsored by Sorbonne Universités (Séminaires internationaux de recherche), Institut Français du Danemark (Programme IFD), Framework Programme 7 from EU (ITN THINFACE).